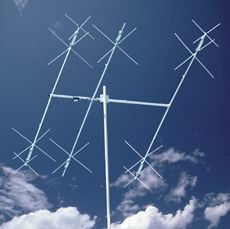 A compact shortwave beam with four elements for all bands from 6 to 20m. Two active elements on each band: 6,10,12,15,17 and 20m. Fits from the measurements almost everywhere - only 2.74m turning radius. 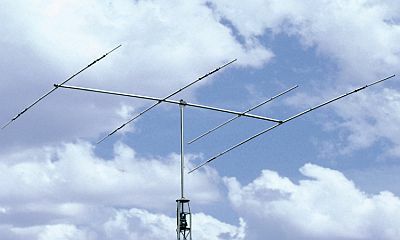 Perfect for getting started with DX operation without having to install a huge antenna. With a maximum power of 1500W, the MA-6B can even be used for contests. The gain is about 3 to 5 dB, depending on the band. In addition to the gain, however, the front/back ratio is almost more important. F/B ratio is up to 22dB (depending on the band) and helps a lot to suppress interfering QRM. Due to the hat capacities and traps a large bandwidth is achieved, usually no lossy tuner is required. Boom length only 213cm, weight 11.8 kg. 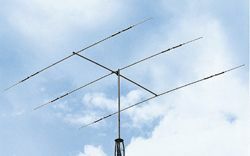 The Rotary Dipole Cushcraft D-3 and D-4 are multi-band dipoles for pole mounting. Both antennas working on 14/21/28MHz. The Cushcraft D-4 will additionaly work on 7MHz too. For more information see the table below.